38th Edition : January 2017. Live slaughter prices drifted even lower in January pushing the indicator rate to Rp41,000. Combined with a slightly stronger Rupiah this has resulted a drop in the AUD rate to $4.14. These weak rates are a combination of poor demand as a result of competition from Indian meat and the fact that many of the cattle slaughtered during January were the last of the over fat remnants of T2 imports held over as a result of the import permit dispute. Abattoirs continue to report that slaughter rates remain around 50% of normal pre-Indian beef levels. One of the most interesting observations for January is the discovery of sales of frozen Spanish beef in Java. According to my wholesale source, this product first appeared around December 2016 and has been selling strongly since arrival. The most surprising factor is the price with a wholesale rate for 95CL of Rp52,000 per kg. Considering that Indian beef wholesales for Rp55,000, this seems to be a remarkably cheap price. 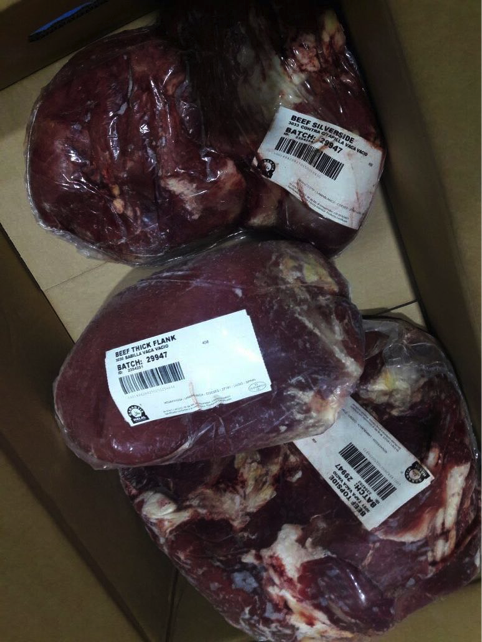 Individual cuts wholesale for around Rp62,000 for knuckle, topside and thick flank. Retail prices in the wet market range from Rp100 to 105,000 per kg when mixed with some fresh meat cuts. Bone-in product is also available including carcases although reports suggest the quality is poor. My source has cooked up some of his product and advises that it is probably cull cow or bull meat but makes an excellent dish of Beef Randang. Import document showing Spanish Consignor. The Indonesian importing company is reportedly owned by a prominent politician and businessman suggesting that this trade could be ongoing as Spain certainly doesn’t have any restrictions for Foot and Mouth Disease as it has been free without vaccination since 1986. I do not have any statistics on the volumes of Spanish product imported to date but it appears that they are substantial and ongoing, so they certainly have the potential to impact the market to some extent. Individual cuts of Spanish product. Plenty of drip in the bag here but at Rp62,000 who cares? 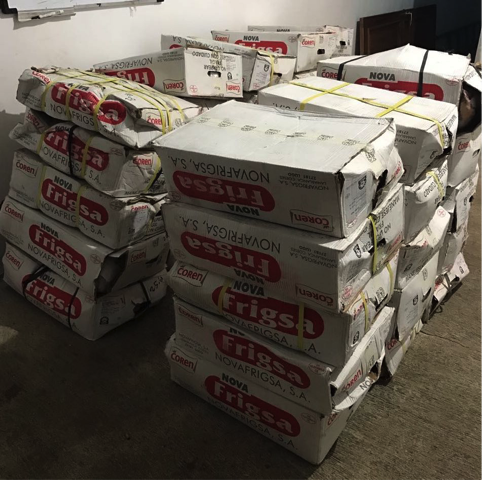 Frozen Spanish product in the freezer after a long journey and some rough handling from Lugo in north-western Spain to central Java. January is a potential turning point in the market as feedlotters have effectively run out of their over fat T2 stock and are now in the process of starting to sell their recent T3 imports. These cattle, although more expensive to buy per kg, are likely to be much more efficiently managed in the feedlot as they can be sold when they are ready instead of held over and rationed out to ensure continuous supply. This at least allows feedlotters to operate with optimal efficiently and squeeze their feeding margins to their maximum levels. My advice is that about 50% of the major feedlot companies are capable of breaking even under today’s conditions as a result of their very efficient operations delivering strong feeding margins. Indian beef imports for the second half of 2016 were approximately 25,000 tons while the estimates from January until the end of June were a further 75,000 tons. As I write this on the 12th of February the Indonesian courts have halted the imports of Indian beef on technical grounds. Given the fact that Indian imports are a policy favoured by the most powerful politicians in the country, I sincerely doubt if imports will be held up for very long. A tonnage of Indian imports of 75,000 is roughly equivalent to 375,000 head of live cattle with a carcase of 200kg. While I suspect this figure is a little optimistic, even if imports are reinstated quickly, it still could be a real possibility for the whole of calendar year 2017. If this is so then 375,000 head equivalent translates again to around 50% of historical live exports so the proposition of a halving of live cattle demand from Australia still looks like a reasonable estimate. My agents in Jakarta continue to visit wet markets and speak with retailers and wholesalers providing reports in line with those of last month. Essentially, domestic customers wishing to buy fresh beef for home use are resisting the low prices of Indian product in favour of traditional fresh beef. On the other hand, sales to manufacturing (bakso balls) and food service, especially low-end restaurants and other cheap food outlets remain strong. Buff sales have been reported just about everywhere including East Java where they remain “under the counter” and don’t appear to be having a significant affect at this point. One very alarming statistic that I heard this month was that some government abattoirs in East Java are slaughtering more than 50% cows (local cattle) every night which further reflects the precarious state of the domestic herd. Prices seem to be relatively stable with only a hint of upwards movement. In the north, imported bulls are selling for D75,000 while feedlot cattle are down to D69 to 71,000. In the south, where stocks are quite low, feedlot cattle are selling for D68-69,000 with over fat steers discounted to as low as D66,500. Slaughter steers imported from Australia with low levels of fat can achieve Dong70,000 per kg. For this month I have used Dong68,500 as my indicator price. With a slightly weaker Dong against the AUD this converts to $4.08 per kg live weight. January included the Tet New Year holiday period so this negligible price movement is a little surprising considering that Tet is traditionally the time of the year for highest consumption of “luxury” foods like beef. Tet lunar New Year celebrations in Vietnam. A few days ago there were reports of a ban on Australian imported cattle by the Vietnamese government in retaliation for restrictions on imports of Vietnamese prawns into Australia. The only advice I have on this is that a reliable Vietnamese source suggested that the issue was overblown and it was not likely to develop into a serious ban on live cattle. Time will tell. Domestic prices are steady with a slight reduction in the AUD rate due to a weaker Baht. If the ban on Australia cattle into Vietnamese takes affect then this could be a major bonus for Thai producers. No change again for this market except for the further slight decline of the Ringgit. Even the trend for very minor monthly increases in the rates for Indian buffalo beef seems to have come to an end with this month’s prices reported at RM18.60 the same as during December. My indicator price for buffalo is for frozen Indian knuckle and topside selling in the wet markets. Prices reported for end of 2016 and January 2017 as below. Using the Ringgit conversion rate of 3.3, this converts the RM18.60 per kg for Indian knuckle to AUD$5.64 or at today’s Rupiah rate Rp55,836. The question this raises is how come Malaysia can import Indian buffalo beef and retail it in the supermarkets for the equivalent of Rp55,836 while Indonesia has Rp55,000 as its wholesale price from BULOG with the lowest Indonesian retail rate at Rp65,000. Where did the Rp10,000 go? Does BULOG need to make a profit margin? Nothing significant to report again except for a slight weakening in the Peso causing the stable live cattle indicator price of 100 pesos per kg to convert to a lower AUD amount. 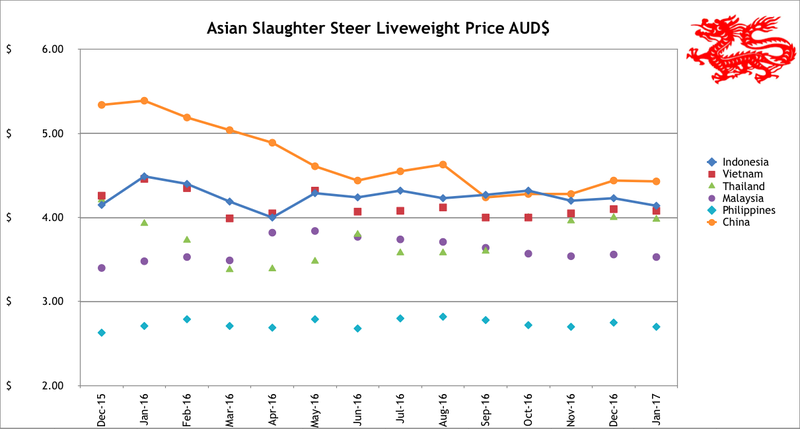 A small increase in the local live cattle price in Beijing to Y22.8 has been cancelled out in AUD terms by the weakening Yuan. 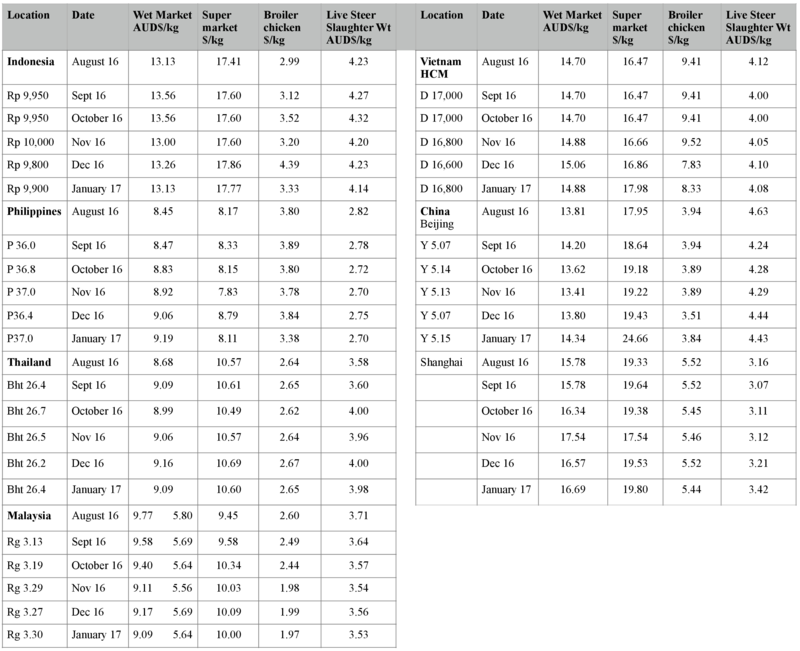 The Shanghai price has shown the most impressive rise from Y16.3 in December to 17.5 in January. This may be simply due to the Chinese New Year celebrations or might perhaps be signalling a reduction in the oversupply of cull dairy cows. Prices in the wet markets and supermarkets increased marginally as expected during the new year celebrations. Low priced South American product continues to be prominent in the retail supermarket sector with prices remaining at earlier rates. With the first shipment of live slaughter cattle on the water as I write this report, all eyes will be on the performance of the slaughtering at the Chinese end. Extremely strict regulations as to the timing of the slaughter of the animals could produce lots of headaches for the processors operating their facility for imported cattle for the first time. Exporters have been providing plenty of technical support to their customers so lets hope this is the start of something much bigger. If domestic cattle prices continue to firm as they have this month, the sums might add up for other importers later this year. 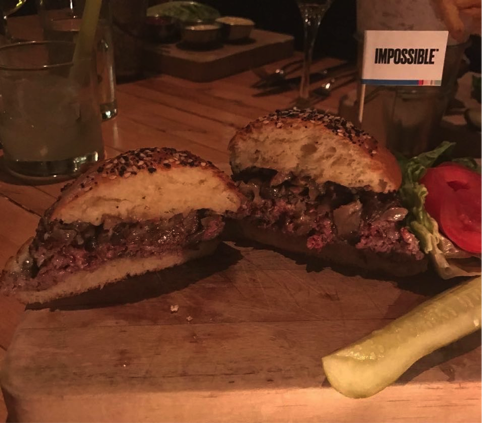 The Bill Gates-backed Silicon Valley start-up Impossible Foods just launched its ‘bleeding’ meat-free burger at two New York restaurants on the 2nd of February. 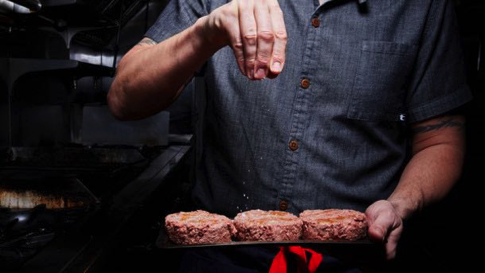 Impossible Foods believes it has created a meat-free burger that not only tastes exactly like beef, but also bleeds like a rare cut of animal protein. Limited numbers of the burgers have only been available in a handful of select restaurants in New York City, Los Angeles and San Francisco. My daughter Zealie and her husband were some of the first to try them out in New York last weekend, Saturday 11th February. She said they were delicious and gave them an overall score of 8.5 out of 10! My daughter’s non-beef burger last Saturday night in New York – score 8.5/10. Promotional photo from the internet. Looks like meat and bleeds when cut!